Britain’s defence ministry covertly deployed a team of interrogators to Iraq’s notorious Abu Ghraib prison at the height of the scandal over the torture and humiliation of inmates, a parliamentary oversight body has found. The operation remained hidden for years until documentary evidence was discovered during an investigation into Britain’s involvement in the CIA’s rendition programme and the mistreatment of detainees. The UK’s Intelligence and Security Committee (ISC) last year produced a damning report which showed that British intelligence agencies had been involved in more than 50 rendition operations and that they had supplied questions to be put to detainees whom they knew or suspected were being mistreated on at least 560 occasions. Despite the ISC’s discovery of the secret Abu Ghraib operation, the UK’s Ministry of Defence (MoD) is refusing to say what its interrogators were doing at the prison, what they reported and how the government responded. Commenting to Middle East Eye in response to a list of questions raised in connection with this article, the MoD also inaccurately said that its interrogators were not based at the prison while it was under US control. MEE asked the MoD for further clarification, pointing out that the prison had been under US control for several months by the time the British interrogators arrived, but did not receive any further response. 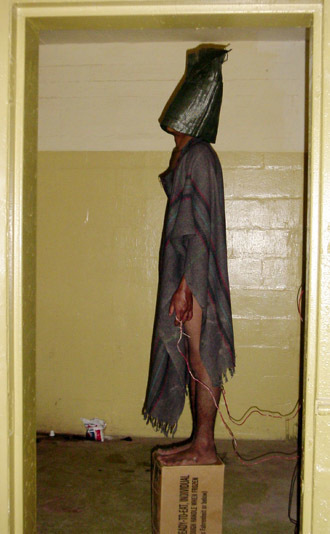 What were the interrogators doing at Abu Ghraib? What did they report to their superiors about the conditions in which prisoners were being held and treated? How did the MoD respond? The refusals appear likely to fuel demands by British members of parliament (MPs) for a judge-led inquiry to be established to discover more about political responsibility for the human rights abuses that the ISC has unearthed. Last week MEE reported that several senior MPs were keen to press the government for a new inquiry into rendition, but that they are waiting until the political chaos surrounding Brexit – the UK’s departure from the European Union – has died down. Three interrogators were deployed to Abu Ghraib from January to April 2004, at a time when the prison held 6,000 inmates. This was some time after the first signs that prisoners were being abused had come to light. Seven months earlier, Amnesty International had warned publicly that prisoners were being shot by US troops while protesting against indefinite detention at Abu Ghraib, and three months earlier the International Committee of the Red Cross had witnessed the mistreatment of inmates during a visit to the prison. No attempt appears to have been made to conceal the abuses from the visiting Red Cross inspectors. The organisation’s report – which was subsequently leaked – said that “during the visit, ICRC delegates directly witnessed and documented a variety of methods used to secure the cooperation of the persons deprived of their liberty with their interrogators”. These included keeping prisoners naked in dark, bare cells for days at a time, forcing men to wear women’s underwear, tightly binding inmates’ wrists, issuing threats and insults, and sleep deprivation caused by loud music and bright lights. “Some persons deprived of their liberty presented physical marks and psychological symptoms,” the report said. This report was passed to the British government in February 2004, shortly after the MoD’s interrogators arrived at Abu Ghraib and two months before they were withdrawn. The following month, 16 US soldiers were charged over their role in the abuses, and in April 2004 photographs that showed the abuse of prisoners appeared for the first time on CBS television in the US. It is around this point that the British interrogators appear to have been withdrawn. The ISC found that Abu Ghraib was just one of several prison where British interrogators and MoD civilian staff were operating following 9/11 and the 2003 invasion of Iraq. It found that the MoD deployed 28 people to the prison at Bagram airbase north of Kabul between December 2001 and July 2002. This is a period when it is now known that many inmates were being tortured. The ISC found evidence that at least 11 of these UK personnel “were engaged in exploiting US detainees for intelligence”. From March 2003 until late 2004, three MoD personnel were based at the US-run prison at Balad airfield north of Baghdad. The committee found that they were withdrawn because of the “inadequate holding facilities for detainees”. Visiting British special forces officers told journalists that they had complained that inmates at Balad were being held in dog kennels. While the ISC discovered that the UK was deeply involved in human rights abuses in Iraq and Afghanistan, the committee’s members believe that the country’s intelligence agencies are currently anxious to avoid becoming mired in such crimes in the future. Privately, however, a number of members of the committee have expressed concern that British military interrogators appear less concerned about their involvement in the abuse of detainees. In 2017, a report by the UK parliament’s defence committee found that British military interrogators had abused their prisoners in Iraq as a consequence of the training they had received, which “may have placed them, unwittingly, at risk of breaking the Geneva Conventions in their work”. Although the defence committee described this as “a failing of the highest order”, its report focused on a flawed criminal investigation into the abuses, rather than the training regime that resulted in those abuses being committed.